Special Lighting For Your Wedding Reception! SAY WHAT –The word “GOBO” is an acronym for Goes Before Optics used interchangeably to describe the small disc with the pattern, the pattern itself, and the actual projection you see. A gobo is a small disc about the size of a silver dollar. The gobo has a design on it, and when a high power lamp is shown through it, the design is projected. Think batman symbol! Gobos can be simple or intricate. They can also include colors. Depending on the pattern needed and the lamp used, they can be made out of several different types of material… typically glass, metal, or plastic. SO WHY All THE HYPE – Gobo lights have many uses, but the ultimate goal is always to make a statement. At a concert, gobos add depth and texture. A gobo projected on the outside of a building can be an eye catching advertisement or in most instances used at your wedding reception… a gobo lightis a distinctive way to tie in your unique monogram while providing a visual attraction for your guests. In a way it puts a visual stamp on your event. If done properly, a custom gobo is a relatively inexpensive way to spruce up a room or compliment any elegant atmosphere. SO WHERE DO I USE THIS AMAZING GADGET – Hello, at your wedding day! A gobo can be projected in any number of places and contexts. 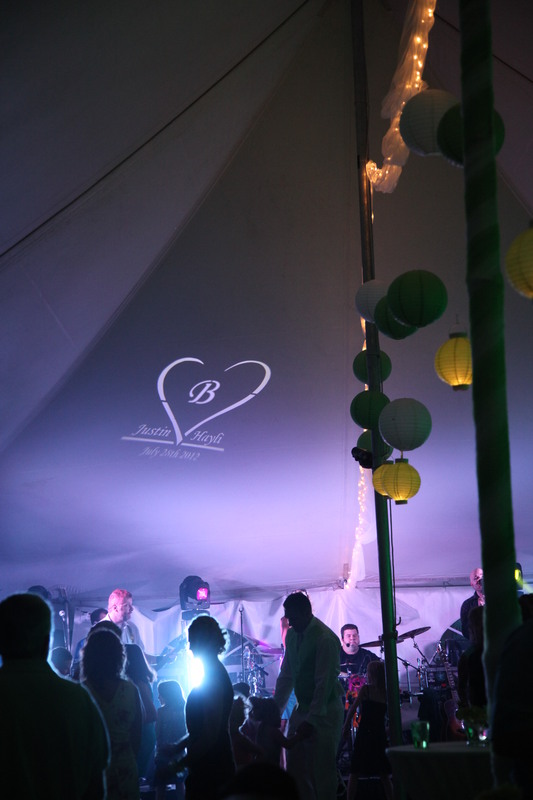 The most common location to see a gobo light is on the dance floor during the reception. However, don’t rule out the possibility of a large wall or the ceiling. Also, there’s no rule that says a gobo doesn’t or won’t look equally stunning shown somewhere around the ceremony location or projected behind the bar during your cocktail hour. You are only limited by your imagination and the approval of your soon to be wife!!! SO YOUR READY AND WANT TO KNOW HOW – If your just looking for a back drop try one of our standard gobo’s. 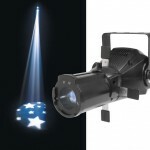 $45.00 includes setup, spot and std gobo. Custom Steel Wedding Gobo (single color) includes setup, spot and custom designed gobo $105.00 ***note needs to be ordered 4 weeks prior to your event to ensure its here in time! NOW TO RECAP – Lighting of any kind can add a unique element of visual stimulation to your Wisconsin wedding reception decor. 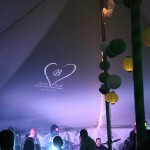 The monogram gobo is an inexpensive way to serve some eye candy to your guests in a tasteful way.